Haddock is a terrific low-calorie, low-fat, high-protein fish. It provides several B vitamins, including niacin, B12, and folic acid; vitamin A; and the minerals potassium, phosphorus, calcium, magnesium, and iron. Haddock is a low-mercury fish, although it is in danger of overfishing. Three ounces of haddock cooked by dry heat provides 95 calories, 0 g carbohydrate, 20.6 g protein, 0.8 g fat, 0 g dietary fiber, 63 mg cholesterol, 54 IU vitamin A, 3.9 mg niacin, 1.2 mcg vitamin B12, 11 mcg folic acid, 339 mg potassium, 74 mg sodium, 205 mg phosphorus, 36 mg calcium, 1.15 mg iron, and 43 mg magnesium. Halibut is a large flatfish found in the northern waters of both the Atlantic and the Pacific oceans. As one of the largest of the flatfish, it has a slightly higher mercury level than flounder and haddock. As a �moderate� mercury fish, halibut is still safe to eat, but don�t have it more than six times a month. It has a very strong complement of vitamins and minerals. Three ounces of halibut cooked by dry heat provides 19 calories, 0 g carbohydrate, 22.7 g protein, 2.5 g fat, 0 g dietary fiber, 35 mg cholesterol, 152 IU vitamin A, 6 mg niacin, 1.2 mcg vitamin B12, 12 mcg folic acid, 490 mg potassium, 59 mg sodium, 242 mg phosphorus, 51 mg calcium, 0.91 mg iron, and 91 mg magnesium. Hemp seeds are a great source of omega-3 and omega-6 fatty acids, both known as �essential� fatty acids. Essential fatty acids are necessary for specific biological processes, but the body cannot make them. These fatty acids are believed to reduce various cardiovascular risks and may also help prevent some forms of cancer. 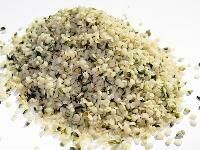 Hemp seeds are a phenomenal source of protein�11 grams of protein in just 3 tablespoons of seeds. Hemp seeds provide calcium, iron, phosphorus, magnesium, zinc, copper, manganese, and vitamin E.
Although hemp comes from the same family as the plant commonly known as marijuana that is grown for its psychoactive and medicinal effects, the varieties of hemp that are used for food and fiber have a negligible amount of the psychoactive chemical THC. Three tablespoons of shelled hemp seed provides 160 calories, 7 g carbohydrate, 11 g protein, 9.8 g fat, 1 g dietary fiber, 57 mg calcium, 5 mg iron, 320 mg potassium, 3.6 IU vitamin E, 210 mcg folic acid, 360 mg phosphorus, 171 mg magnesium, 3 mg zinc, and 3 mg manganese. Peanuts are groundnuts�not true nuts, but legumes. A New World plant, they are native to Central and South America, but they are now grown and eaten around the world. The People�s Republic of China is the greatest producer of peanuts. The United States is the fourth-largest producer, with production of about 1.7 million tons annually. Peanuts, like other legumes, are a rich source of both protein and fiber. Although peanuts are relatively low in the amino acids cysteine and methionine, they are high in lysine, and they balance well with grains, which are high in methionine but low in lysine. A cup of peanuts provides 30 grams of protein. Nearly half of the carbohydrate in peanuts is dietary fiber�12.4 grams of fiber in one cup. Peanuts are also a very good source of niacin and folate, and a significant source of pantothenic acid, magnesium, phosphorus, and zinc. Although peanuts are nearly half fat by weight, about half of that is monounsaturated, and only 13 percent is saturated fat. Roasted peanuts may rival some berries for antioxidant content, including resveratrol and Coenzyme Q10. The nutritional Benefits of peanut butter depend on how it is made. All-natural, fresh-ground peanut butters are the most like peanuts, though you have to remember that any peanut butter is much more calorie-dense than whole peanuts. Peanut butters tend to have more sugars and fats but less fiber than whole peanuts, though they are still a high-quality source of protein, fiber, energy, vitamins, and minerals. Despite their many health Benefits and the longtime popularity of peanuts and peanut butter as staple foods for children, these days you are more likely to hear about peanuts causing allergies and being banned from schools. This is a serious issue, because for those who are allergic to peanuts, the reaction can be life-threatening anaphylactic shock. Research is ongoing, but it appears that roasting may increase the allergenic properties of peanuts. Most peanut butter is made from roasted peanuts. It�s still controversial whether introducing peanuts to children at a young age is more likely to prevent the allergy or cause it. Raw peanuts also sometimes carry a mold called Aspergillus that can be dangerous to health. Two tablespoons of unsalted all-natural peanut butter provides 210 calories, 6 g carbohydrate, 8 g protein, 16 g fat, 2 g dietary fiber, and 0.36 mg iron. There are two types of fish commonly called pollock available in United States markets: Atlantic pollock and Alaska�or walleye�pollock. Although related, the two fish are not of the same genus, and they have different spawning and fishing grounds. Pollock is a gray- or white-fleshed fish, with a somewhat more distinctive taste than cod and haddock. Alaska pollock is milder and whiter than the Atlantic variety. Pollock has grown in popularity as other white fish have been subject to overfishing. The Alaska pollock fishery is strictly managed, although Greenpeace has now put Alaska pollock on its list of endangered fish. 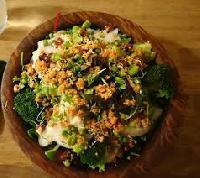 Pollock is one of the lowest-mercury fish, so it is safe to eat frequently. Like many similar fish, pollock is very low in saturated fat and a very good source of protein, vitamin B12, phosphorus, and selenium. It provides substantial riboflavin, niacin, vitamin B6, magnesium, and potassium. (atlantic pollock) Three ounces of Atlantic pollock cooked by dry heat provides 100 calories, 0 g carbohydrate, 21.2 g protein, 1.1 g fat, 0 g dietary fiber, 77 mg cholesterol, 34 IU vitamin A, 3.4 mg niacin, 3.1 mcg vitamin B12, 3 mcg folic acid, 388 mg potassium, 94 mg sodium, 241 mg phosphorus, 65 mg calcium, and 73 mg magnesium. (alaska pollock) Three ounces of Alaska (walleye) pollock cooked by dry heat provides 96 calories, 0 g carbohydrate, 20 g protein, 0.95 g fat, 0 g dietary fiber, 82 mg cholesterol, 71 IU vitamin A, 1.4 mg niacin, 3.6 mcg vitamin B12, 3 mcg folic acid, 329 mg potassium, 99 mg sodium, 410 mg phosphorus, 5 mg calcium, and 62 mg magnesium. Salmon is a low-mercury, fatty fish that contains a very high level of omega-3 fatty acids, which are vital to healthy brain and circulatory function. It is also a good source of vitamin D and protein. Salmon live in both the Atlantic and Pacific oceans, as well as in the Great Lakes. Although there are some concerns about overfishing some types of salmon� for example, commercial salmon fishing is very limited in California�wild Alaska salmon come from well-managed fisheries that still have adequate stocks of fish. Salmon are also farmed. In fact, the vast majority of the Atlantic salmon available are farmed fish. Because these fish are fed a controlled diet, the balance of the omega-3 fatty acids may not be as good as it is in wild-caught fish. Farmed salmon may contain a somewhat lower level of omega-3 fatty acids overall. There is also a risk of higher levels of some contaminants, notably dioxins and PCBs, in the farmed fish. Salmon farming has been implicated in the introduction of harmful parasites to nearby wild salmon populations, leading to the decline and possible extinction of wild salmon in some areas. The red color of salmon is the result of antioxidant carotenoids, including canthaxanthin and astaxanthin. (Atlantic salmon, however, do not contain canthaxanthin.) Astaxanthin appears to be a particularly powerful antioxidant, with positive effects throughout the body and special benefit to the brain and nervous system. Some farmed salmon are fed astaxanthin to improve their color. Three ounces of wild salmon cooked by dry heat provides 155 calories, 0 g carbohydrate, 21.6 g protein, 6.9 g fat, 0 g dietary fiber, 60 mg cholesterol, 37 IU vitamin A, 8.6 mg niacin, 2.6 mcg vitamin B12, 25 mcg folic acid, 1.6 mg pantothenic acid, 534 mg potassium, 48 mg sodium, 218 mg phosphorus, 13 mg calcium, and 31 mg magnesium. There are as many as 21 fish that can be called sardines: The name applies to a number of related small, oily fish, some of which are also called pilchards, and some of which are actually herring. Because sardines are typically smaller than four inches in length, they are especially low in mercury. The young fish eat mostly plankton, which is not a strong source of mercury. As oily fish, they are rich in omega-3 fatty acids, vitamin D, and protein. Since they are typically eaten bones and all, they are also a good source of calcium. In addition, they provide selenium, phosphorus, and iron.Although in some parts of the world sardines are eaten fresh, they are the archetypical canned protein food. Ironically, many canned �sardines� are actually herring, a related fish. Herring have been studied for their high concentration of Coenzyme Q10, a nutrient involved in cell metabolism. Sardines, especially those that are really herring, share this characteristic. Four and three-eighths ounces of skinless, boneless sardines packed in water provides 120 calories, 0 g carbohydrate, 15 g protein, 6 g fat, 0 g dietary fiber, 60 mg calcium, and 2.25 mg iron. Sole is a name used for several white-fleshed flatfish. All are high in protein and low in calories and fat. With a delicate texture and a buttery flavor, sole is a fish that is easy to like, even for people who are not used to eating fish�a good �starter fish.� It is low in mercury. The nutritional profile of sole is similar to that of flounder. It is a good source of vitamins A, B6, and B12, as well as minerals, including selenium. Three ounces of sole cooked by dry heat provides 100 calories, 0 g carbohydrate, 20.5 g protein, 1.3 g fat, 0 g dietary fiber, 58 mg cholesterol, 32 IU vitamin A, 1.9 mg niacin, 2.1 mcg vitamin B12, 8 mcg folic acid, 246 mg potassium, 15 mg calcium, and 49 mg magnesium. Soy nuts are a great way to satisfy the craving for a crunchy snack while still being good to your health. These roasted soybeans have all the Benefits of soy, including lots of protein, folate, potassium, and fiber. The soybean is regarded as a complete protein, providing all the essential amino acids, and soybeans are one of the highest- protein legumes. Soybeans are about 20 percent oil. One benefit of adding soy to your diet is that it can replace animal sources of protein that tend to have higher levels of cholesterol and saturated fats. In addition to adding less cholesterol than animal proteins, soy may even have a cholesterollowering effect. Soybeans contain isoflavones that are phytoestrogens�plant-based estrogens. Initially, phytoestrogens were hailed for their potential to relieve symptoms of menopause and reduce the risk of some cancers, heart disease, and osteoporosis. Research has been shown to be inconclusive, however, as estrogen supplementation has been found to have a mix of health Benefits and health hazards. One-fourth cup of roasted soy nuts provides 202 calories, 14 g carbohydrate, 15 g protein, 11 g fat, 7.6 g dietary fiber, 86 IU vitamin A, 1 mg vitamin C, 90.5 mcg folic acid, 632 mg potassium, 70 mg sodium, 156 mg phosphorus, 59.5 mg calcium, 1.7 mg iron, 62.5 mg magnesium, 1.3 mg zinc, and 0.93 mg manganese. Tempeh is most commonly used as a meat replacement. It originated in Java, and one of its nicknames is �Java meat.� It contains whole soybeans that have been cooked, fermented, and formed into a cake. The long tendrils of the tempeh mold help hold the tempeh together and give it a firmer texture than tofu. Because tempeh uses whole soybeans, it retains the fiber, mineral, and isoflavone Benefits of soy, as well as the protein and fat. The fermentation may make it more digestible for some people and may make its mineral content easier to absorb. The mold used to ferment tempeh may also favor helpful intestinal flora over those that cause dysentery and other diseases. One-half cup of tempeh provides 165 calories, 14.1 g carbohydrate, 15.7 g protein, 6.4 g fat, 0 g dietary fiber, 569 IU vitamin A, 3.8 mg niacin, 43 mcg folic acid, 305 mg potassium, 5 mg sodium, 171 mg phosphorus, 77 mg calcium, 58 mg magnesium, 1.88 mg iron, 1.5 mg zinc, and 1.19 mg manganese.